Unemployment Rate Drops To 8.6 Percent : The Two-Way The highly anticipated news brought a surprise: The unemployment rate had been expected to stay at 9 percent. But it fell in part because of an increase in the number of "discouraged" workers. They've given up looking for jobs. A job fair in San Francisco last month. The nation's unemployment rate fell to 8.6 percent in November from 9 percent in October as payrolls went up by 120,000 jobs, the Bureau of Labor Statistics says. While the jobless rate is now the lowest it's been since March 2009, economists say one reason it fell isn't good news — the size of the labor force shrank by 315,000 as more people stopped looking for work because they're discouraged about the chances of finding a job. Also tempering the enthusiasm about today's news: 120,000 new jobs on payrolls is still considered to be weak growth. We'll be updating this post with more from the report. Update at 10:15 a.m. ET. White House, Republican Reactions. "Any job creation is welcome news, but the jobless rate in this country is still unacceptable.Today marks the 34th consecutive month of unemployment above eight percent. As you may remember, the Obama administration promised unemployment would stay below eight percent if its 'stimulus' was enacted. That promise has gone unfulfilled. "Because the president's policies have failed, the House has passed a series of bills designed to remove government barriers to private sector job creation. There are now 25 bipartisan jobs bills passed by the House awaiting a vote in the Senate. The key to getting all of these jobs measures enacted is the United States Senate. President Obama should use this opportunity to call on Senate Democrats to immediately give these bipartisan bills the vote they deserve. "The American people want action on jobs, and the House is listening to the American people." "While the U.S. economy is healing, the world economy continues to be in a fragile state and all economies are linked through trade and finance. In this environment, the President's American Jobs Act is the right medicine to sustain and strengthen the recovery. In particular, with 13.3 million Americans still unemployed, and 43 percent of them unemployed for 6 months or longer, it would be a setback for the economy and American families if Congress were to allow extended unemployment benefits to expire at the end of the year. The President's proposal to extend and expand the payroll tax cut for workers and small businesses also would provide a substantial boost to economic growth and job creation." BLS says "the civilian labor force participation rate declined by 0.2 percentage point to 64.0 percent." That's another way of saying that more people were not actively looking for work — a sign that many had given up. Because of the "discouraged workers" who gave up looking for jobs and the effect that had on lowering the jobless rate, there is "a little bit of a dark cloud" behind the report, economist Hugh Johnson tells our Newscast Desk. "Employers began shedding workers in February 2008 and cut nearly 8.7 million jobs for the next 25 months," The Associated Press notes. "Since then, the economy has regained nearly 2.5 million of those jobs." Update at 9 a.m. ET. On The Other Hand, Revisions Make Previous Months Look Better. -- BLS had thought payroll employment rose by 80,000 jobs in October. Now, it estimates the gain was 100,000. 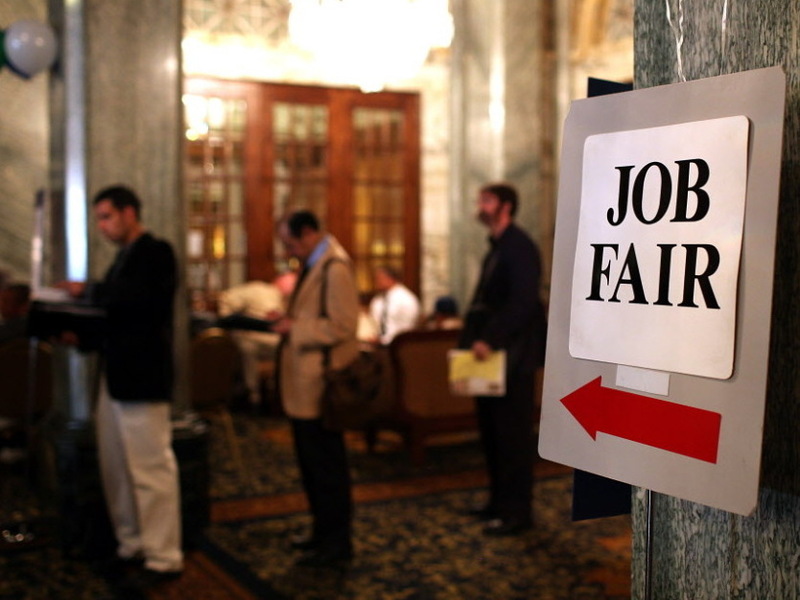 -- September's payroll gain had been reported as 158,000 jobs. Now, it's pegged at 210,000. BLS says payrolls grew by 50,000 at retailers, by 33,000 in professional and business services, and by 22,000 in the leisure and hospitality industries. All those are "seasonally adjusted" figures — meaning, for instance, that the estimated gain at retailers supposedly takes into account the fact that they normally add on employees for the holidays. The adjustment, in theory, is supposed to reflect the "real" change in employment. While payroll employment rose by 120,000, that figure includes both private and public employers. Government agencies, BLS says, shed 20,000 positions. Payrolls at private employers grew by 140,000. Kathy Bostjancic, director of macroeconomic analysis at The Conference Board research group, says in an email to reporters that "the continued modest employment gains reflect an economy that plods along at an uninspiring pace." Update at 8:37 a.m. ET. More "Discouraged Workers." The Associated Press points out that "one reason the unemployment rate fell so much was because roughly 315,000 people gave up looking for work and were no longer counted as unemployed." Before the report's release, NPR's Yuki Noguchi looked at how the news this year about unemployment and job growth had been remarkably consistent — and not particularly good. Our friends at Planet Money are planning to pick the report apart.